For someone such as Sufjan Stevens, opening an album with a declaration of abandonment feels strange. It's uncharacteristic of a man whose previous records have been expansive, often jubilant tours de force of multi-instrumentalism, tracing lyrical lines through Biblical stories and American history, with tracklistings often running to the late teens; the work of a musician who knew, it seems, where to begin. 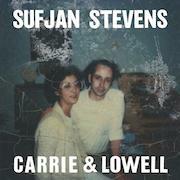 But then Carrie & Lowell is an uncharacteristic record, one which doesn't follow Stevens' trajectory of taking a sonic departure from what's come before, instead returning to the plaintive folk of his earliest records as a vehicle for words that, for the most part, jettison allusion for bracing honesty. By the end of that opening song, Stevens has unveiled the beating heart of the album: "I forgive you, mother, I can hear you/ And I long to be near you," weaves together the pain the singer felt when his mother Carrie died in 2012 with the act of grieving for someone only ever partially known. Carrie left her family when Stevens was one, only seeing him and his siblings again four years later, spending three summers with them in Eugene, Oregon where she then lived with her new husband, Lowell Brams. After that, she again departed from the singer's life, struggling against bipolar disorder, depression, schizophrenia and substance abuse. "Sometimes she'd be at our grandparents' house, and we'd see her during the holidays for a few days. There was the occasional letter here and there. She was off the grid for a while, she was homeless sometimes, she lived in assisted housing," Stevens explained, in one of the few interviews he's given about the album. In response to such an absentee figure, Stevens constructed a fantasy of her - "When I was three, and free to explore/ I saw her face on the back of the door," he sings on 'Should Have Known Better' - and it's to this ghost or apparition, terms with which he refers to her on the record, that Stevens addresses the album. It's a record riven with grief that is itself laced with hurt and confusion, and each song is burdened with the weight of a different facet of this painful emotional assemblage. 'Eugene' addresses it through the specificity of memory's minutiae, with Stevens remembering learning to swim, his teacher, perhaps Lowell, failing to pronounce his first name, instead calling him "Subaru", a moment that's now cast under the "hysterical light" of time past. 'Drawn To The Blood', meanwhile, hangs an understandable question off the rapid downstrokes of an acoustic guitar: "For my prayer has always been love/ What did I do to deserve this?" Bringing it into the most acute focus, perhaps, is 'Fourth Of July', which takes the shape of a dialogue between Stevens and Carrie. "Part of me felt that I was possessed by her spirit and that there were certain destructive behaviours that were manifestations of her possession," says Stevens in the same interview, talking about the period that followed Carrie's death, drinking and drug use being those "destructive behaviours", and it's telling that over the song's course, the strands of the conversation that start out as distinct ("I'm sorry I left, but it was for the best", "The hospital asked should the body be cast") align, to the point where, "Shall we look at the moon, my little loon/ Why do you cry?" could be either Stevens or Carrie asking the question of the other. The album is sparse musically, but it doesn't feel bare. The gorgeous richness that frequently ornaments Stevens' songs surfaces in the synth that glints in the final third of 'Should Have Known Better' evolves the tinny Casio twinkling in Seven Swans' 'The Dress Looks Nice On You' and 'Drawn To The Blood' and 'Fourth Of July' repose in some of the afterglow of The Age Of Adz' heavily-wired grandiosity. But Carrie & Lowell is its own entity, one that functions by only giving the songs the props they need, say the solar flare of electric guitar at 'The Only Thing's two-thirds mark or the revelry of overtones that strain out of the synth at the end of 'All Of Me Wants All Of You', and the album is made greater by this lack of overt showiness. The onus, no doubt, is on the words, and as the album progresses, Stevens' imagery gets simultaneously more visceral and more figurative, a quality that combines with devastating effect. The title track is nothing if not bruising; again, childhood images flicker as Stevens passes beneath the covered bridges of Cottage Grove from the summers in Oregon, but these sidle up alongside the vision of a figure with "[h]ead on the floorboards (covered in blood)/ Drunk as a horsefly", matched to the litany of ways he tries to understand his mother: within the song's frame, she is all of Erebus and ephemera, a mayfly and "Thorazine's friend" at once. That song is preceded with 'The Only Thing', which gilds the album with a fleeting moment of hope. Over the sweetest of metallic arpeggios, Stevens contemplates ways in which he could kill himself, driving his car into a canyon in the dimming light or slitting his wrists in a Holiday Inn bath, but instead finds solace in "signs and wonders", be they in the natural world, "God's grace" or "blind faith". "Do I care if I despise this?" he asks at the song's second chorus, finding, perhaps, an empowering distance in apathy, though it's a question to which he presents himself with no definitive answer. And that's how the album closes, in the flux of uncertainty. "Raise your right hand/ Tell me you want me in your life/ Or raise your red flag/ Just when I want you in my life," he sings on the final track, 'Blue Bucket Of Gold', lines that encase the lack of knowing at the centre of his relationship with his mother, two options that can, now, only linger in space. In talking of Carrie's death, Stevens has said, "There was a reciprocal deep love and care for each other in that moment" and you hope that that, and the album, a process of grieving itself, can be strengths that are sustaining in the face of such a loss. As the spectral drone of 'Blue Bucket Of Gold' finally ebbs away, it's not certain whether the acre to the desert forest has been crossed, but the feeling that abides is one of compassionate admiration for Stevens, not only for making this beautiful album of unfaltering rawness (and one which may even provide a crutch, a brutal one, for others), but for all of his work that has preceded it, music which frequently transcended the hurt of a life so wounded at its root.